Arriving at work one day to find your property tagged with graffiti is a frustrating experience. Graffiti devalues your property, is costly to remove, and looks ugly. Being proactive in reducing the chances of it happening are better than being reactive in removing it. While no one can absolutely guarantee that you won’t be a victim, you can act to lessen the risk. Here are some steps that have worked for others. Graffiti vandals like to do their work in the dark of night. They need the secrecy that comes from working in darkness. A bright set of floodlights changes the environment in a way that vandals do not like. Given the choice of standing out in a lighted area at your property or working in darkness somewhere else, vandals are more likely to go elsewhere. Shrubs that make your building hard to reach can be a deterrent to vandals. Better yet, shrubs with a thorny or prickly texture are especially effective. Few people want to contend with thorns. Vandals want to paint and run. They definitely do not want to be caught on law enforcement video surveillance, which can lead to arrest and conviction. In fact, a law enforcement surveillance camera might be just the difference in your building getting tagged or staying clean. If you want to go a step further, you might even consider live monitoring of your site. Remote operators can call out a warning to vandals over a speaker and call the police. You can have films placed over windows. If you get tagged, the protective film can be stripped off and replaced with a new layer of film. The advantage of protective films is that they are inexpensive to replace as opposed to changing out glass. You can now buy specially formulated paints that make it difficult for spray paints to adhere to a surface. These paints inhibit bonding to the surface, preventing vandals from creating the designs they want. Whatever paint does stick can be washed away easily, leaving a clean surface. 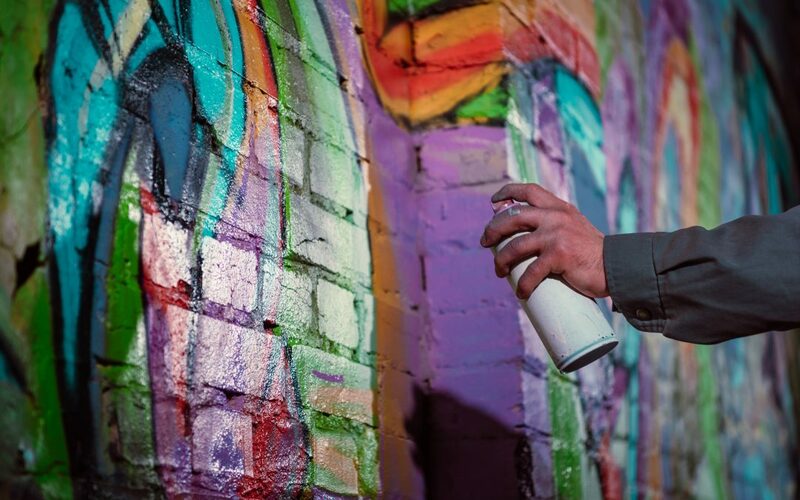 You have many options for reducing the chances of your property being tagged with graffiti. From simple things like adding flood lights to more elaborate steps such as law enforcement surveillance, your options to lower your risk of being vandalized come in many different forms. You just need to evaluate your level of risk and then do what’s most appropriate for your situation.